1. Andrew A. High was born in Ava, Illinois on 21 November 1897. 2. Two of his brothers, Hugh and Charlie, played in the Major Leagues. Andy had the best career of the three. 3. He joined the US Navy in World War I as an electrician’s mate. 4. In 1919 he began play with the Memphis Chicks Minor League team. Initially an outfielder he moved to third base in 1920 and was bought (along with Dazzy Vance) by Brooklyn in 1922. 5. He remained with Brooklyn into 1925 when he was put on waivers. Boston (the Braves, not the Red Sox) picked him up. He moved on to St. Louis in 1928. 6. 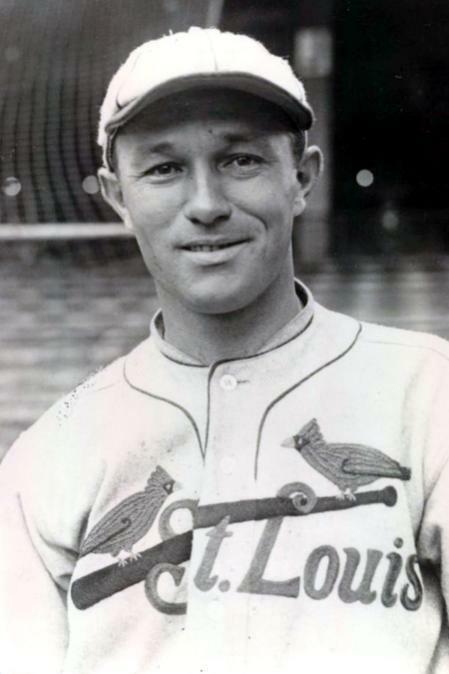 High was with St. Louis for three pennant winners: 1928, 1930, and 1931. 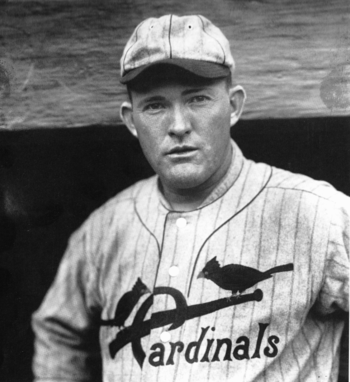 His ninth inning run scoring single on 28 September 1928, tied the score and helped lead the Cardinals to a pennant clinching victory in 15 innings. 7. By 1930, he was working as the team’s primary pinch hitter and backup third baseman. He had only one appearance in the 1930 World Series, but started four (of seven) games in 1931. He scored two runs in the Series clinching seventh game. The final score was 4-2. 8. In 1932, he was traded to Cincinnati. He did poorly, was released mid-1933, and went to Columbus in the American Association. He got into 47 games with the Philadelphia Phillies in 1934. 9. He spent 1935 in the minors, then landed a coaching job with Brooklyn in 1936 which lasted through 1938. 10. In 1939 he became a scout for Brooklyn where he signed both PeeWee Reese and George Kell, two Hall of Fame infielders. 11. He left the Dodgers in 1943 and rejoined the US Navy. He was a SeaBee, serving with a construction unit in the South Pacific. 12. High returned to Brooklyn as a scout in 1945 and became Chief Scout in 1950. He remained in that position until his retirement in 1963. 13. He died in Ohio in 1981. Back in 1989 my son and I watched the World Series between Oakland and San Francisco. Although known today primarily as the “Earthquake Series” the Series was a four game sweep by Oakland. It was, to be brutally honest, a thorough crushing. My son asked if I’d ever seen a more one-sided World Series. I admitted I hadn’t. So being a clever child he started looking through baseball encyclopedias and finally announced he’d found a World Series as lopsided as 1989. It was the 1928 Series. Here’s a brief rehash of that Series. In 1926, the St. Louis Cardinals burst onto the baseball scene, becoming the last of the 20th Century’s National League teams to win a pennant. Then they managed to defeat the “Murder’s Row” New York Yankees in seven games (including Alexander’s strikeout of Lazzeri, arguably the most famous strikeout in Major League history). The Yankees, unlike the Cards, repeated by winning the American League pennant in 1927 and manhandling the Pittsburgh Pirates in four games. Both St. Louis and New York won in 1928, setting up a rematch of 1926. The Cardinals were a good team. Hall of Fame pitchers Grover Cleveland Alexander and Jesse Haines anchored the staff with lefty Bill Sherdel and right hander Flint Rhem rounding out the starters. Haines and Sherdel had 20 wins, Alexander 16, and Rhem 11. That sounded better than it was. Of the four, only Haines had more innings pitched than hits allowed and Rhem had walked more men than he struck out. The hitting stars were Hall of Famers Jim Bottomley, Frankie Frisch, and Chick Hafey, while Taylor Douthit and George Harper also put up good numbers. Although he didn’t hit much, Hall of Fame shortstop Rabbit Maranville could still play a decent short at age 36. The Yankees were loaded. 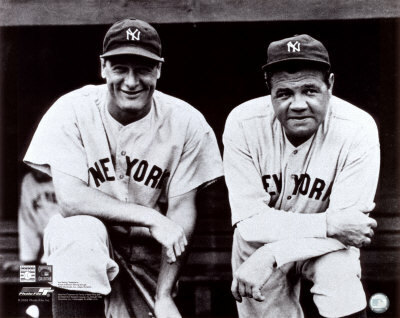 The duo of Babe Ruth and Lou Gehrig were in their prime. Tony Lazzeri and Mark Koenig both hit .300, as did Earle Combs (who was hurt and didn’t play much in the Series). The staff included Hall of Fame righty Waite Hoyt, fellow Hall of Famer lefty Herb Pennock, George Pipgras, and bullpen specialist Wilcy Moore. The first game was played 4 October in New York. The Yanks got an early lead when Ruth and Gehrig hit back-to-back doubles to score Ruth with the first run. They added two more in the fourth when Ruth doubled and, after an out by Gehrig, Bob Meusel belted a two-run home run. A Jim Bottomley homer in the seventh got a run back, but the Yanks returned the lead to three runs in the eighth, with consecutive singles by Koenig, Ruth, and Gehrig to score Koenig. The game ended 4-1 with Hoyt getting the win and Sherdel taking the loss. It was the closest game. If game one turned out to be the closest game. game two was the biggest blowout. And there had to have been a great satisfaction in getting it at the expense of 1926 hero Alexander. The Yanks got three runs in the first when following a single and a walk, Gehrig clouted a three-run home run. The Cards plated three in the second to tie the game. After a walk and a double scored a run, Lazzeri committed a huge error (on a throw) that sent a second run home. Then a double play grounder gave St. Louis a third run. New York got the lead back the next inning on a walk, a sacrifice, and a single. The third was the Yankees big inning. Ruth singled, Gehrig walked, then Meusel doubled to score the Babe. After a walk and a single sent Gehrig home, Alexander plunked catcher Benny Bengough to bring in a run. A single scored a fourth run and only a great throw from Douthit saved another run. The Yanks tacked on a final run in the seventh on a single, a stolen base, a sacrifice and a pinch hit single by Joe Dugan. After a travel day, the Series resumed 7 October in St. Louis. The Cards broke on top with two runs in the first. With one out, third baseman Andy High singled, Frisch followed with another single, then Bottomley tripled to score both men. New York responded with a home run from Gehrig in the second, then took the lead in the fourth when Ruth walked and Gehrig legged out an inside-the-park home run (hit to deepest center field) that scored two runs. The Cards tied it back up when Douthit was plunked and High doubled him home in the fifth. The Yanks responded with a very unYankees-like inning. Koenig singled, was forced at second with Ruth taking first. Gehrig walked (something he did a lot of in the Series). Meusel then grounded to third. High flipped to second to force Gehrig, but Ruth raced home. The relay to catcher Jimmie Wilson was on-line, but he dropped the ball, letting Ruth score. Meusel took third on the play. After a walk to Lazzeri, New York executed a double steal, Lazzeri going to second and Meusel stealing home. A single brought in Lazzeri with the third run of the inning. New York got one last run in the seventh when an error by Hafey and a Ruth single gave them a seventh run. Down 3-0, St. Louis sent Sherdel back to the mound on 9 October. New York countered with Hoyt. For six innings it looked like the Cards might have a chance to play a game five. They got one in the third when outfielder Ernie Orsatti doubled, went to third on a bunt and scored on Frisch’s sacrifice fly. The Yanks got the run back in the fourth on Ruth’s first Series homer. In the bottom of the fourth Maranville was safe at second on a botched double play relay throw by Koenig. The next man was out, then Hoyt tried to pick off Maranville. The ball sailed into the outfield and the Rabbit came home to put St. Louis ahead. That lasted until the seventh. With one out Ruth hit his second home run of the game. Gehrig followed with a homer of his own. Meusel singled, went to third on Lazzeri’s double, and scored on the next play, Lazzeri going to third. In his only appearance of the Series, Earle Combs then hit a long sacrifice to right that plated Lazzeri. In the eighth, backup outfielder Cedric Durst hit a home run, and the Babe crushed his third home run of the game (and Series) to finish the Yankees scoring. The Cardinals picked up one final run in the ninth, then Frisch popped a foul to Ruth in left to end the game and the Series. It wasn’t even close. The Cards managed 10 runs to New York’s 27. Maranville led the Cards with a .308 average. Bottomley hit only .214, but had three RBI’s. Only Maranville scored more than one run (He had two.). The staff was shelled. Sherdel took two losses, Alexander and Haines each took one. Haines 4.50 ERA was the best among the starters. The team ERA was 6.09. They had both 13 walks and 13 strike outs. New York, on the other hand, played wonderfully. Here’s the triple slash line for Ruth .625/.647/1.375/2.022. He had three home runs (all in game four), four RBI’s, 10 hits, and scored nine runs. Gehrig might have been better. His triple slash line reads .545/,706/1.722/2.433. He had four home runs, nine RBI’s, six hits, and scored five runs. His lack of hits was largely the result of walking six times. Of his two hits that weren’t home runs, one was a double. No other Yankee did as well, but Durst hit .375 and Meusel had three RBI’s and a steal of home. The pitchers put up an ERA of 2.00 while striking out 29 and walking only 11. Every game was a complete game victory with Hoyt getting two of them. It was a complete beat down. And after the loss of 1926, must have been particularly sweet for the Yanks, especially for Lazzeri who managed a double and scored a run against Alexander. Both teams would go on to play good ball over the next several years, New York winning another pennant in 1932 and St. Louis in both 1930 and 1931. They would not, however, meet again in the World Series until 1942. And I promise no more music based titles with Missouri themes (at least for a while). It was a heck of a year for Missouri. U.S. Senator Harry Truman from Independence was leading a major committee that was instrumental in helping the war effort. In baseball with both St. Louis teams winning Major League Baseball pennants, the World Series would be an all-St. Louis affair in 1944. All games would be played in town with the Cardinals being the home team in games one, two, six, and seven. The Browns got games three, four, and five. All games were played in Sportsman’s Park, a stadium the two teams shared. The Cards were big favorites. With the Browns having needed the last day of the season to clinch the pennant, they sent Denny Galehouse to the mound. Galehouse was 9-10 over 24 games (19 starts) over the season. With Chet Laabs back from war work, they were also able to start the man who was supposed to be their regular left fielder. The Cards countered with their regular lineup and ace Mort Cooper (22-7 over 34 games). After three scoreless innings, the Browns got to Cooper when, with two outs, Gene Moore singled and George McQuinn hit a two-run home run. They were the only two hits Cooper gave up. The scored held into the bottom of the ninth when Marty Marion doubled, went to third on a ground out then came home on Ken O’Dea’s sacrifice fly. Galehouse then got Johnny Hopp to fly to center to end the game. The underdog Browns were up 1-0. That lasted exactly one day. The second game saw the Browns send Nels Potter to the mound to oppose Max Lanier. The Cards scored first in the bottom of the third on an Emil Verban single, a Lanier bunt that Potter threw away, sending Verban to third. Augie Bergamo then grounded out to second scoring Verban. The Cards added another run in the fourth when Ray Sanders singled, went to second on another single, took third on an error by the third baseman (Mark Christman), then scored on a sacrifice fly by Verban. The Browns tied the game in the seventh when Moore singled, scored on a double by Red Hayworth, and Frank Mancuso (pinch-hitting for Potter) singled to score Hayworth. That completed the scoring through the ninth. The game went eleven innings and ended when Sanders singled, went to second on a bunt, and came home on O’Dea’s single. Reliever Blix Donnelly got the win and fellow reliever Bob Muncrief took the loss. Game three saw the Browns take over as home team. With no need to travel, the game was played the next day. The Cards started Ted Wilks while the Browns answered with ace Jack Kramer. The Cardinals got an early run in the first when, with one out, Hopp reached second on an error by shortstop Vern Stephens, then after another out, scored on a single by Walker Cooper. The run held up into the third when the Browns exploded for the Series’ first big inning. Moore and Stephens both singled, then consecutive singles by McQuinn, Al Zarilla, and Christman plated three runs. After an intentional walk and a wild pitch to hurler Kramer, Zarilla scored the fourth run. After the Cards tacked on an unearned run in the top of the seventh, the Browns responded with two more runs to win 6-2. Kramer got the win with a complete game and Wilks the loss pitching only 2.2 innings. After three games, the underdog Browns were actually ahead 2 games to 1. Game four was played on Saturday 7 October. The Cards sent Harry Breechen to the mound to oppose Sig Jakucki. With one out in the top of the first, Stan Musial popped a home run scoring himself and Hopp to put the Cardinals ahead. It was all Breechen needed. He gave up nine hits, walked four, struck out the same number, but only allowed a single run (in the eighth on a double play ball), while his teammates tacked on three more runs, two in the third on a couple of singles and an error, and one more in the sixth on a Marion double. The game tied the Series at 2 each, turning the playoff into a best of three. Game five on Sunday saw a repeat of the game one matchup. This time the results were different. Galehouse gave up single runs in the sixth (a Sanders home run) and eighth (a Danny Litwhiler home run), while Mort Cooper threw a complete game shutout on seven hits and two walks while striking out 12. That brought the World Series to game six, a Lanier, Potter rematch. It also sent the Cardinals to the home dugout. The Browns broke on top in the second with a Laabs triple followed by a McQuinn single. The run held up into the bottom of the fourth. With one out, Walker Cooper walked, went to third on a Sanders single, and scored to tie the game when Stephens threw away a grounder from Whitey Kurowski. After a second out, Verban and Lanier both singled to drive in two more runs and put the Cards up 3-1 with five innings left. Lanier got through the fifth, ran into trouble in the sixth, and was lifted for Wilks, who got out of a base runners at second and third situation without a run scoring. Wilks set the Browns down in order in both the seventh and eighth. In the ninth, McQuinn fouled out, pinch hitter Milt Byrnes struck out, and a second pinch hitter, Mike Chartak also struck out to end the game, the Series, and the Browns postseason experience. The Cardinals had won in six games. It was a good, but not great Series. For the Browns there were lots of reasons they lost. They had 10 errors, at least one in every game but game one (by contrast, the Cards had one total error). They led to seven unearned runs (the Cards scored 16 total runs). Among starting hitters only McQuinn hit above .250 (he hit .438 and had the only Browns home run). As a team they hit a buck eighty-three. The pitchers (other than Jakucki who was shelled) did well. The team ERA was 1.49 and the staff struck out 43 while walking only 19 and giving up 49 hits. But the Cardinals staff was as good. Their ERA was higher at 1.96, and they walked 23, but they struck out 49 and allowed only 36 hits. There was no real hitting star for the Cards. Five men had two RBIs, no one had more. Verban hit .412, but both Musial and Walker Cooper were over .300 and Sanders hit in the .280s. There were three home runs, all by different players (Musial, Litwhiler, and Sanders), and Verban, Walker Cooper, and Musial all led the team with seven hits. It was a true team effort. For the Cardinals it was the third in a series of four pennants in five years. So there was one more opportunity (1946) for the Redbirds, but for the Browns it was the high point of their existence. It was the only time they would win a pennant (until after they moved to Baltimore and became the Orioles). For St. Louis it was the city’s greatest baseball season. And for Missouri it was also a good year. That Senator from Independence named Truman went on to be elected Vice President of the United States and became President the next year. If the National League race was predictable with the Cardinals triumphant, the American League race was absolutely wild. To start with the St. Louis Browns won it. They’d never won anything, ever. The 1944 pennant was their first. All-time underachievers, the Browns won 89 games, besting Detroit by one game. Manager Luke Sewell’s team was next to last in batting average, but was second (to Boston) in runs per game. They were second in RBIs, doubles, and home runs. The staff was second (to Detroit) in runs given up per game and led the AL in strikeouts. The catchers were Gus Mancuso and Red Hayworth. Hayworth played in two more games than Mancuso, but both were right-handed hitters. Apparently it wasn’t a platoon situation, but I can’t determine the exact rationale for using each player. Manager Sewell was an ex-catcher so perhaps he was merely keeping his catcher fresh. Both hit under .225 and had a homer apiece. The infield was the same as in 1943 with George McQuinn at first, Don Gutteridge at second, Vern Stephens holding down short, and Mark Christman at third. Christman had replace long time third sacker Harland Clift midway through 1943, but the other had been Browns starters for both seasons. McQuinn and Stephens were the only Browns with double figure home runs (McQuinn had 11, Stephens 20). Stephens also led the team with 109 RBIs and was the only infielder to hit over .275. Gutteridge led the team with 20 stolen bases. The outfield was unsettled. Gene Moore, Mike Kreevich, and Milt Byrnes did most of the outfield work, but that was because longtime left fielder Chet Laabs lost part of the season to the war (he was back by the World Series). Kreevich was the only starter to hit .300 (.301). He was also 36 years old. He replaced Mike Chartak as the primary center fielder prior to opening day. So only Byrnes had been a starter in 1943. The bench was a strong point for the Browns, which helped propel them to the title. Laabs, in 66 games had five home runs and scored 28 times. Al Zarilla, a backup outfielder (and primarily known today for Dizzy Dean’s call of “Zarilla slud into third.”) hit .299, had six homers, six triples, and an OPS of .823. The rest of the bench was made up of decent fielders who didn’t hit a lot. It was the pitching staff that changed the fortunes of the Browns. Gone were Steve Sundra, Steve Niggeling, and Al Hollingsworth as starters (Hollingsworth was a reliever, Sundra pitched three games). In their place were new ace Jack Kramer, Sig Jakucki, and Nels Potter. Both Potter and Kramer had better ERAs than any of the three departed starters. Returning starters were Bob Muncrief and Denny Galehouse. Their ERA+ ran from Kramer’s 146 to Jakucki’s 103. The starters faced one problem, all were right-handed. All the southpaws were in the bullpen. The bullpen had George Caster with 12 saves in 34 appearances, all in relief. My wife’s grandfather was a diehard Browns fan. He told me stories, on more than one occasion, about the 1944 Browns. They won the pennant on the final day of the season and according to my wife’s grandfather, the entire town of St. Louis celebrated, even Cardinals fans. They knew they were seeing something they’d never seen before and , considering the Browns historical record, were likely never to see again, an all St. Louis World Series. The 1944 season was completely different. Many quality players were off to war. A lot of diamond geezers were suddenly young again. A whole bunch of never-was types were playing in the Major Leagues. And the World Series came to St. Louis and stayed. For the only time prior to 1974, both pennant winners were from west of the Mississippi River. 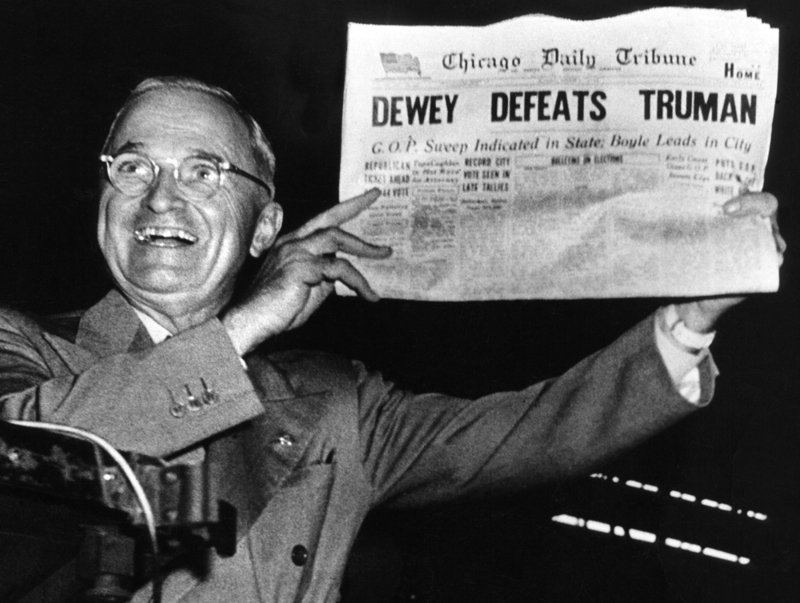 To top it off, Senator Harry S Truman of Missouri was nominated and later elected Vice President of the United States. It was quite a year for Missouri. The Cardinals were returning National League champions having won pennants in both 1942 and 1943 (and picking up the win in the 1942 World Series). So they were expected to contend for a third consecutive pennant. Manager Billy Southworth’s team was much the same team that had swept to victory the two previous seasons. But there were changes that impacted the team. On the staff, Mort Cooper was still the ace and Max Lanier remained the number two man, but the remainder of the staff underwent significant overhaul. 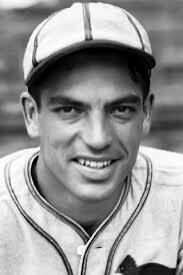 Harry Breechen went from 13 to 22 starts and settled in as the second lefty (behind Lanier) while rookie Ted Wilks led the NL in winning percentage. Mort Cooper’s brother Walker was the regular catcher. His batting average dropped a couple of points, and his RBIs dropped by 10, but he went from nine to thirteen homers and saw his OPS+ jump to 136 (third on the team). In the field he managed to cut down on both his errors and passed balls. He was never going to be the best catcher of his era, but he was improving. The infield was much the same. Ray Sanders held down first both seasons, Whitey Kurowski was at third, and Marty Marion (who would win the 1944 National League MVP) was at short. Both Sanders and Kurowski had double figure home runs (12 and 20) with Kurowski leading the team. There was a new second baseman. Second was a problem for the Cards through the entire first half of the 1940s with only Creepy Crespi spending more than one season (he got two) as the primary second sacker. The 1944 version featured Emil Verban. he managed to hit in the .270s for his career but had only one homer ever (and it wasn’t in 1944). He was a decent middle infielder but hit eighth for a reason. The Cards would finally solve the problem when they brought up Red Schoendienst in 1945 and installed him at second the next year. The outfield, unlike the infield, had seen great turnover. 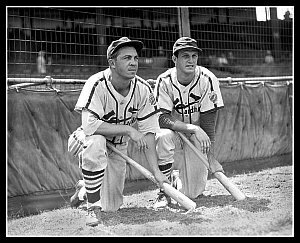 Gone to war were veteran center fielder (and one of the great undervalued Cardinals) Terry Moore and Hall of Fame right fielder Enos Slaughter. In their place were Danny Litwhiler in right. He’d replaced Slaughter in 1943 and hung around the next season. He was second on the team with 15 home runs. The new center fielder was Johnny Hopp. Hopp had been around St. Louis since 1939 splitting time between first and the outfield. He was fast (leading the team with 15 stolen bases) and a capable fielder. So although both were relatively new as starters, they’d been around the team for a while. Of course the other outfielder was Stan Musial. He hit .347, had an OPS of .990 (OPS+ of 174–the team high), and had 12 home runs to go with 14 triples and 197 hits. During the war years, benches tended to suffer. The Cardinals bench was, at best, indifferent. Backup catcher Ken O’Dea was 31 and hit .249. Debs Garms was 37, did much of the backup work in the outfield and at third and hit all of .201. Pepper Martin, out of retirement, was even older. At 40 he got into 40 games and hit .279 and ended up with an OPS+ of 118 one point higher than the other backup outfielder, Augie Bergamo. The Cards won 105 games, the same as the year before, finishing 14.5 games ahead of Pittsburgh. As mentioned above, Marion brought home the MVP with Musial finishing fourth and the Cooper brothers finishing eighth (Walker) and ninth (Mort). Sanders, Hopp, Wilks, and Kurowski also picked up a handful of MVP votes. They would go into the World Series heavily favored. Not only were they defending NL champions, but their opponent had never won a pennant before. They were going to face their crosstown rival Browns. I’ll make only this comment. They got number one right. If you disagree take it up with ESPN. It seems that the steroid era isn’t really over. 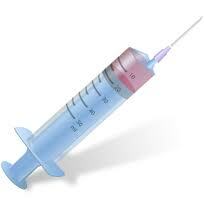 Baseball claimed, and many of us hoped, that the steroid era was behind us. We could get back to games that were played by real people, not steroid-filled monsters. Apparently the “many of us” were wrong. Initially I was outraged, but not this time. This time there’s more of a sad resignation and realization that we’re going to go through the entire mess again. I’m kind of sorry I feel that way, but I’ve just gotten beyond moral outrage and anger. Of course they’re still doing it. The incentives are too great. Baseball doesn’t care. A lot of fans don’t care. Why should the players care? Makes sense doesn’t it? At least kinda. Frankly I hope they ban the lot of them. Make the teams start over. So what if we lose some fine players. We’ve lost fine players before, some to war, some to injury, some to out-and-out racial prejudice. Why should we weep more for this latest round of louts? I don’t expect “purity” in baseball. It’s a business for God’s sake and businesses have never been overly “pure” in their dealings with each other or the public. But I do expect at least a small amount of respect for the game. I’ve learned to not expect respect for the fans, but sure asking for respect for the game isn’t too much. Or is it? Considering most of these guys don’t know a damned thing about the history of the game (Quick, ask one of these dope heads who won the 1948 World Series and see how many “Cleveland” answers show up.) I guess I’m asking too much. I’ll still watch. It’s a great game and even these jokers can’t ruin it; so I’ll still watch and root for my team. But I’ll also know that there’s an awful lot of fiction in what I see. Baseball is full of guys having great seasons. Both Cabrera and Trout had great seasons last year. So far the kid in LA is having a great week. Babe Ruth is noted for great seasons between 1920 and 1924. But Rogers Hornsby also had a couple of great seasons in the National League while Ruth was tearing up the American League. Hornsby played second base for the Cardinals in 1922. He got into 154 games. Here’s a look at Hornsby’s 1922 year, a year that you could argue wasn’t his best. In April Hornsby played 15 games. He got hits in all but three (and in one of those he walked in all four of his plate appearances). He hit .389, slugged .704, had an OBP of .469, had 21 hits, four of them home runs. The two games in which he had both at bats and no hits were not back to back. They were against the Reds and Cubs. In May he played 28 games. He hit .371, slugged .705, had an OBP of .464, with 39 hits and 9 home runs. In the 28 games he went hitless four times, none of them consecutive. They were against the Giants, Phillies, Pirates, and Cubs. In June he played in 23 games. He hit .427, slugged .667, had an OBP of .477, with 41 hits and four home runs. He went hitless in three games. For the first time in the season he was hitless on consecutive days, 26 and 27 June. Both games were against the Reds. The other game was against the Giants. None of the games were back-to-back. So we’re half way through the season and what do we have? So far Hornsby has played in 66 games and failed to hit in nine of them (only once in back-to-back games). He has 101 hits and 17 home runs. His average is .396. So far only the Braves and Dodgers have failed to hold him hitless at least one time. Now on to July. He played in 35 games (lots of double headers). He hit .383, slugged .752, had an OBP of .425 with 54 hits and 10 home runs. He failed to get a hit four times, once each against the Reds, Phillies, Giants, and Braves. None of the games were consecutive. In August he played 22 games. He hit .380, slugged .663, had an OBP of .447 with 35 hits and five home runs. He went hitless in only two games all month. One each against the Braves and Cubs. Again, the two games weren’t back-to-back. In September he played 29 games. He hit .438, slugged .792, had an OBP of .463 with 57 hits and 10 home runs. He went hitless twice. The Cubs and finally the Dodgers (Robins at the time) managed to hold him without a hit. Neither game was consecutive. It was his best month. He played one game in October and got three hits. All were singles. As St. Louis did not make the World Series, his season ended on 1 October. For the year Hornsby hit .401, slugged .722, had an OBP of .456. He had 250 hits, 42 were home runs, 46 were doubles, and 14 were triples. He stuck out 50 times and walked 65, and had 450 total bases. He scored 142 runs and drove in 152. His OPS was 1.181 and his OPS+ was 207. He would surpass both the OPS and OPS+ twice (1924 and 1925). His offensive WAR was 11.2. It would be slightly higher in 1924 (11.5), but not in 1925. Only once did he fail to hit in consecutive games (but he did manage to go hitless against all seven opponents).In 154 games he was hitless in 17. For all that the Cardinals, who had a little beyond Hornsby, finished third. Hornsby’s 1922 is one of the great seasons ever. In compares well with Ruth’s best years. Some baseball historians downplay Hornsby arguing that he wasn’t much of a second baseman, specifically that he had trouble going back on the short pop up at second. OK, maybe he did. But I think I’ll take the bat anyway. Well, I’m back from high school graduation. She made it through. We made it there and back. Along the way I picked up a book to read in down time. It’s called “The Gashouse Gang”, it’s by John Heidenry, and here’s a quick review of it. The book is a look at the 1934 St. Louis Cardinals, who won the World Series that year with one of the more colorful teams ever. The book concentrates more on the players than on the games. It centers around Dizzy Dean (naturally) and occasionally you forget that there were other players on the team. Heidenry sees Dean as intelligent and manipulative, a classic con man who can pitch. There are a dozen or so episodes in the book centering on Dean that make him come alive as a person. There are also sketches of general manager Branch Rickey, of manager Frankie Frisch, and of a handful of the players. The sections are uneven in that the comments on Joe Medwick are more in-depth than the comments on Ernie Orsatti. The same is true of other players. The players Heidenry finds most fascinating (or maybe that he can find the most info on) range over several pages. These include players like Paul Dean (who apparently hated being called “Daffy”), Pepper Martin, Medwick, and Leo Durocher while other players like Rip Collins, Spud Chandler, and the non-Dean pitchers get only passing reference. Jack Rothrock is almost invisible. There is also a nice, but short, sketch on Sam Breaden, the owner. Heidenry spends the better part of a chapter trying to determine where the moniker “Gashouse Gang” came from. He finally decides that the New York papers came up with it in 1935, the year after the Cards won the Series. He also spends a couple of chapters on the 1934 World Series (against Detroit) with a nice character sketch of Mickey Cochrane thrown in as a welcome bonus. All in all it’s a good book and worth the read if you’re a fan of 1930s baseball. It’s even better if you’re a fan of the Cardinals. The book was published in 2007 and is available in paperback at Barnes and Noble. It retails for $17.99. You are currently browsing the Verdun2's Blog blog archives for June, 2013.